Wilmuth Luther, or Wilma as she likes to be called, greets Brick Street Bakery customers with a hug and smile. It’s something they’ve come to expect. For Wilma, everyone is family. At age 69, her body aches. She deals with an intellectual disability, although it hasn’t stopped her from finding success. Never fail, Wilma is at Brick Street three days a week making donuts, breads and scones. There are also the less glamorous chores of sweeping, cleaning bathrooms and washing dishes. But she doesn’t mind. 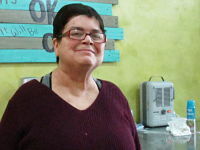 Wilma has found success and expanded her skills since joining Brick Street Bakery in 2017 and, prior to that, Brick Street Books and Café, where she was hired in 2014. It has also provided her with a valued role in the Adel community and helped ease the symptoms of her disability. Brick Street Bakery and Brick Street Books and Café are both microbusinesses owned and operated by Optimae LifeServices. Optimae is a health care and human services company that provides comprehensive services to approximately 4,000 Iowans with mental illness and disabilities. It opened the businesses as a way to provide supported employment opportunities to its clients, who are paired with job coaches to help build their skills. Optimae now runs 10 microbusinesses spread across Central and Southeastern Iowa that support more than 80 jobs for its clients. Wilma’s success at Brick Street has also helped her outside of work. Adel residents have embraced her. She goes to church with customers from Lincoln Savings Bank, which neighbors the bakery. Wilma now works exclusively at the Brick Street Bakery in its new location. If you haven’t been in to get one of her heart-warming greetings, you are missing out.